Go Zion is designed to help our community become more healthy and active. The Zion Park District has partnered with the Lake County Health Department on a county wide initiative to improve the health of Lake County residents. Live Well Lake County is promoting the simple act of walking, 30 minutes a day, as a means to improve health. Join us and your neighbors in walking your way to better health! This walk is a FREE family event. Strollers are welcome. No pets please. 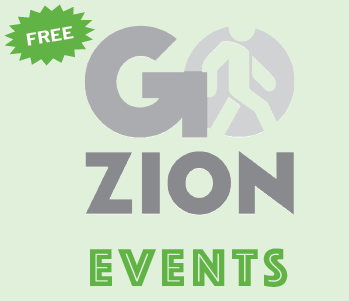 The first 20 walkers to register at the Zion Park District will receive a free GO ZION t-shirt.On-site registration available 8:30-9:00 am day of event. 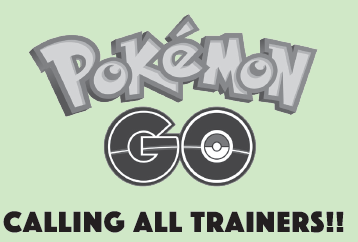 POKEMON GO – Calling all Trainers!! Zion Park District is hosting a Pokémon Go Event; we will have prizes, free lanyards, raffle prizes, and more. This event will be hosted at the Leisure Center; it has a lot of stops, and gyms nearby. 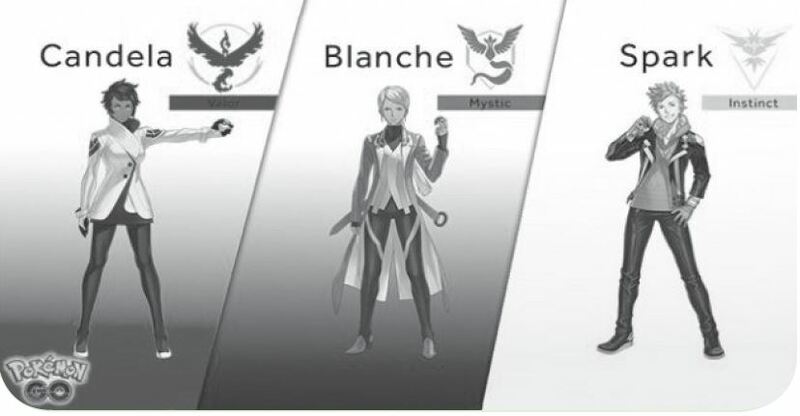 We will have the place lured up to have some exciting Pokémon to show up. VIP tickets will come with 7-12 raffle tickets. The number of raffle tickets depends on which VIP ticket you purchase. VIP Tickets are just a fun way to get extra raffle tickets. Thursdays 7:00-8:30pm Zion Park District Band Shell, located immediately adjacent to the Zion Leisure Center, 2400 Dowie Memorial Drive, Zion. Final Say plays over 170 shows a year throughout the Chicago area. They bring all the biggest hits from the 60’s, 70’s, 80’s & 90’s, whether it’s Alternative, Classic Rock, Soul, Motown, New Wave, Big Hair Rock, or R&B they will be sure to get you on your feet! Join in the fun! Known as one of the most energetic, dynamic female-fronted country bands in Chicago. Wild Daisy brings a mixture of tunes from Country, Pop/Rock & Current Hits. Wild Daisy delivers a family-friendly, crowd-interactive performance and will provide an exciting live concert for all ages. Since 1996, Rhythm Rockets have been a mainstay of the music scene, delivering 100+ shows a year of vintage Rhythm & Blues, with songs influenced by the sax-driven bands of the late 40’s and early 50’s. In keeping with that style of music their performances reflect the diversity of Jazz, Rhythm & Blues for which Chicago is famous. The Band members are local musicians who live in IL and WI. JB Kickin’ offers a fine mixture of traditional Country music and 50’s -90’s Rock. Known for their incredible harmonies and mesmerizing stage presence, it is a show you won’t forget. Motown, Soul, Rock & Roll is exactly the sound that defines this Chicago band. This energetic, dynamic seven-piece band has many years of experience and really knows how to entertain! Between the funky hits of the 70’s the one-hit wonders, the disco and the soulful songs of that era, you will be moved to dance and sing. BBI has toured nationally and abroad in Japan, Canada, Poland, the Virgin Islands and St. Thomas. Regionally or internationally, BBI connects with their audiences and inspires people to party, dance and have a great time! They offer a true variety of songs from Motown, Rock & Roll, Classic Rock, Reggae, 80’s Dance, Funk, Pop, Rap, Country and even Hip Hop. Bring the entire family for a great time. Rosie & The Rivets perform the best danceable music of the 50’s and 60’s along with some current hits which includes a retro twist that will make everyone jump out of their seats to sing and dance. They enjoy playing on vintage guitars and drums so you’re in for a truly retro-cool experience. This will be a show you won’t forget! Please Note: In case of inclement weather, concerts may be moved into the Sports Arena. 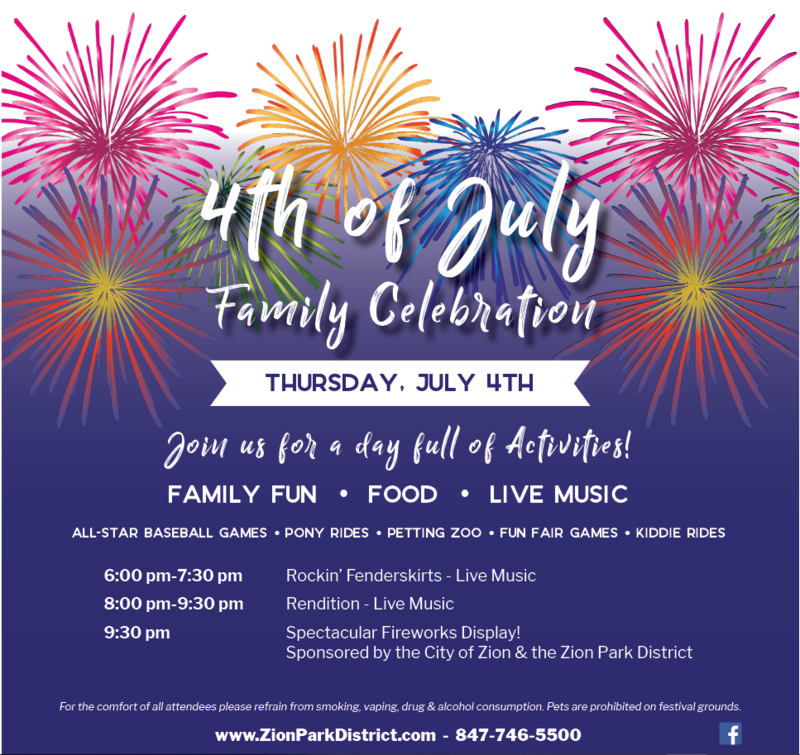 For more information, please call the Zion Park District at 847-746-5500.
call the Zion Park District at 847-746-5500. 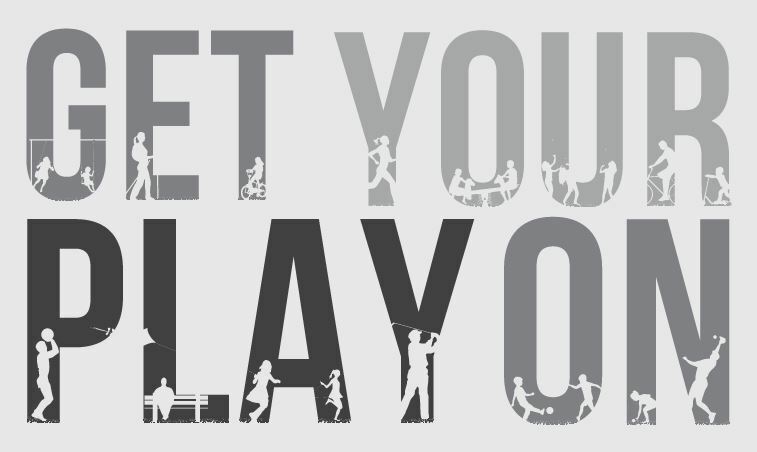 Summer is here, which means it’s time to get your play on. This July, discover the power of play with the Zion Park District. A variety of fun activities are planned for residents of all ages and abilities. Meet at a different location each week and join the fun! Are you a yoga enthusiast or maybe just curious? Come and enjoy the outdoors for “Yoga in the Park!” Bring your families and friends of all ages! A mat or a towel is needed. Zion’s Labor Day Festival, features community wide activities, including a Queen’s Pageant, Concerts, Illinois’ largest Labor Day Parade, Fireworks and many more events and attractions! WATCH FOR FURTHER DETAILS AND SCHEDULE OF EVENTS. The festival will be held in conjunction with the Zion Labor Day Festival on Monday, September 2 from 10:00 am to 4:00 pm. If you are interested in displaying your work, registration forms are available at the Zion Park District Leisure Center office. Please call 847-746-5500 for additional information.